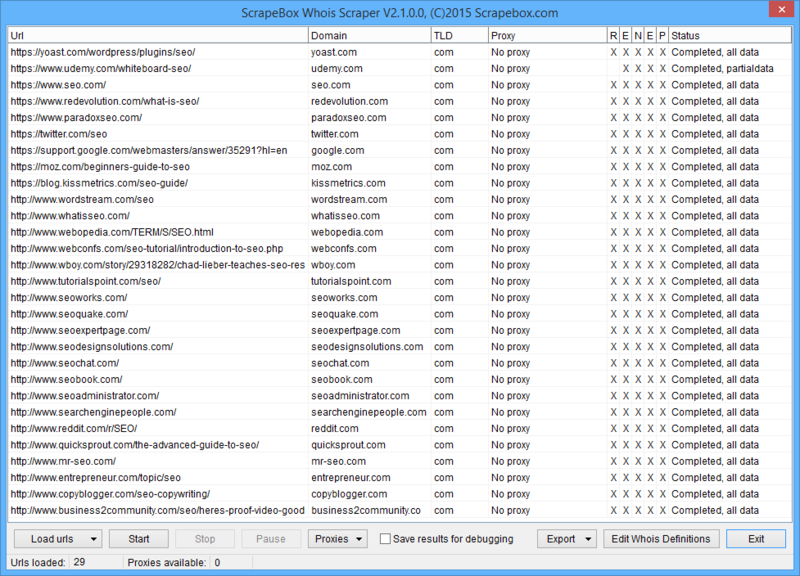 The ScrapeBox Whois Scraper addon lets you import a list of domains, and extract the whois data such as when the domain was registered and when it expires, the registrant name,the registrants email address and Phone Number. This is ideal if you need to contact website owners, need to see when domains expire or for doing market research. 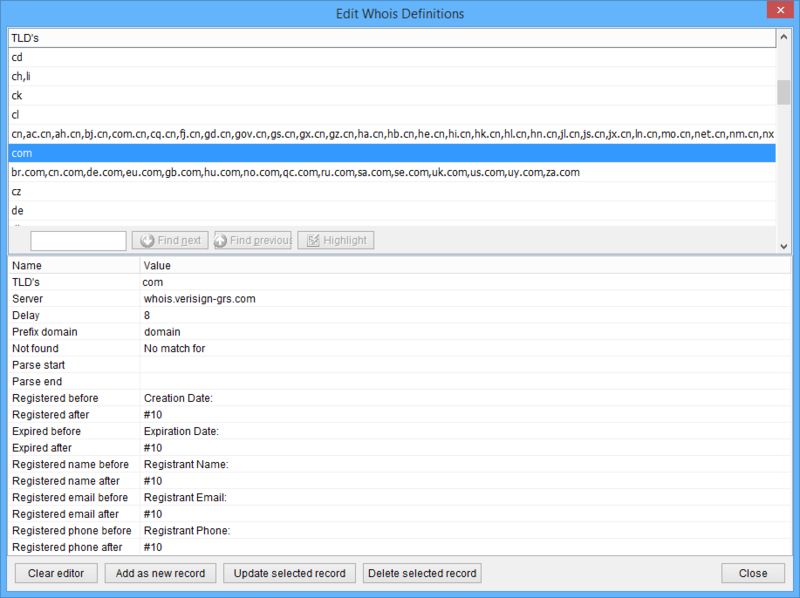 The Whois Scraper can export all data to an .xlsx file suitable for usage in Excel. It’s also possible to use a list of proxies which are rotated with every request to avoid being blocked from doing too many whois lookups per minute. We have also recently added a Blacklist Feature, allowing you to independently filter results based on words contained within the registrants Name or Email. So now you are able to add keywords to filter out things like domains with whois guard or privacy protection, or even domains owned by competitors or large companies you do not wish to contact. Trainable whois servers means you now have the ability to fully customize all aspects of the whois lookup and extensions. With new domain extensions being released daily such as .club and even .coffee, you can add new TLD’s yourself quite easily without waiting for a software update. You can also customize what data you want to be scraped by adding a before and after marker to tell the Whois Scraper to fetch everything in between like the registered owners Phone Number! Along with being able to fully customize the TLD, Whois Server and the data being scraped you can add a delay option for each individual TLD. So for example if the .org extension limits you to 3 lookups per minute, you can change the delay to 20 seconds to stay within the specific whois servers rate limit. Export all your whois data to an .xlsx file after checking is complete for use in Excel. The exported information contains the Domain Name, Registration Date, Expiry Date, Registrant Name, Registrant Email and the Registrant Phone Number. This allows you to Email or Phone domain owners regarding their domains or websites. Note, with the trainable whois definitions it’s also possible to alter those to extract different information such as the Admin or Tech contacts Email and Phone Number instead. 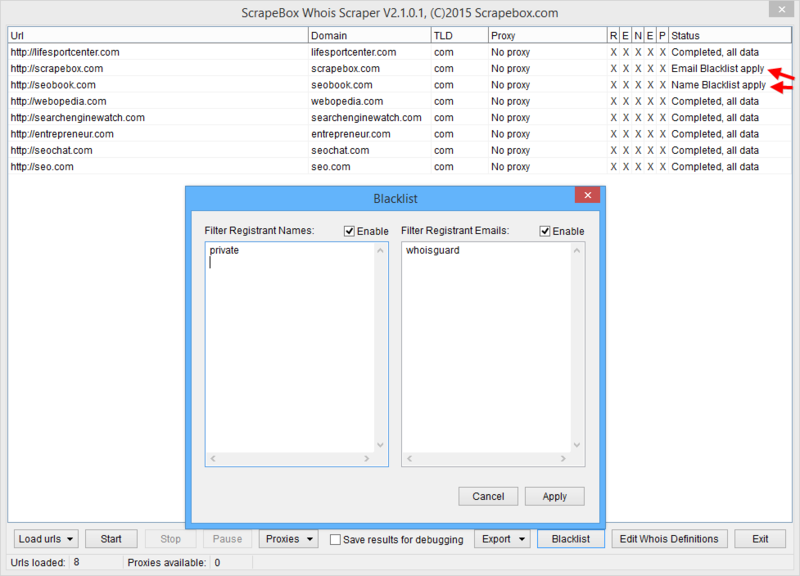 View our video tutorial showing the Whois Scraper in action. This addon is included free with ScrapeBox, and is also compatible with our Automator Plugin.